KVPY 2018 Interview Schedule & call letter has been released. The exam is organized by the Indian Institute of Science (IISc). Kishore Vaigyanik Protsahan Yojana (KVPY) is a national level fellowship programme. Department of Science and Technology, Government of India has started this programme in 1999. It is conducted to provide scholarship upto pre-Ph.D level to the selected candidates. The selection will be based on the aptitude test & interview managed by the IISc. Answer Key has been released. Here, we have mentioned the complete information about KVPY 2018. KVPY 2018 Interview Schedule & call letter has been released. Check here for counselling details. KVPY 2018 Result has been declared on 21st December 2018. Check here for result details. KVPY 2018 Question papers along with tentative answer key has been released. Check here for answer key details. In the given table, we are providing the official schedule of KVPY 2018. Candidates will be called for the selection procedure on the basis of their performance in the KVPY Aptitude Test. The selection process will include interview round. The interview round will be held in the last week of January 2019. Candidates will be informed about interview dates, time & venue through email/website. After the successful completion of the entrance exam & interview round, the scholarship will be provided to the successful candidates. Candidates can check their results on 21st December 2018 through online mode. The KVPY result has been announced by the officials. After the declaration of the result, the provisional list of shortlisted candidates is also published for further process. Keep the print copy of the result of the selection process. KVPY is national level scholarship program administrated by the Indian Institute of Science (IISc). It is conducted to offer scholarship upto pre-Ph.D level to the selected candidates. The examination will be conducted in the month of November 2019. The exam conducting authority has been released the KVPY 2018 answer key for all the three streams, i.e., SA, SB, SX. Along with answer key, the candidates can also download the question paper of respective stream. The answer key has been released on 10th November 2018. Answer key contains the solutions of all the questions asked in the examination. Question: Is it compulsory that candidates have to study all the four subjects, i.e. PCBM (Physics, Chemistry, Mathematics & Biology)? Answer: In Stream SA, all questions are compulsory (Science & Mathematics). In respect of Stream SX & SB, there will be four sections in PART I (Physics, Chemistry, Biology and Mathematics) & PART II (Physics, Chemistry, Biology and Mathematics). Candidates have to attempt any of the three subjects in PART I & any two subjects in PART II. Question: When will the KVPY Application Form announce? Question: What is the last date of submitting an application form? Question: Can I take a computer based test in Hindi? Question: What are the eligibility criteria to apply for Stream SA? Answer: Candidates have to pass their class 10th with Mathematics & science subjects. Check the eligibility criteria section above for more details. Answer: The application fee is Rs. 1000 (Rs. 500 for SC/ST/PwD category). Question: What is the mode of the exam? Answer: The exam will be organized through online or offline mode. Question: What is the KVPY Syllabus 2018? Answer: There is no prescribed syllabus for KVPY 2018. The written exam aims to test the understanding and analytical ability of the student than his/her factual knowledge. 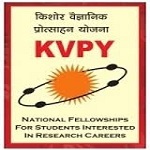 Question: Can I avail the KVPY Fellowship along with a merit scholarship? Answer: KVPY does not allow its Fellows to receive simultaneously fellowship /scholarship from more than one source, either government or private. In case they are in receipt of any other fellowship or scholarship, they will have to relinquish it in order to avail the KVPY Fellowship. Question: I have a scanned copy of my photograph/signature/caste certificate, the file size of which exceeds the limit mentioned in the online application form. What should I do? Answer: Please compress the file and then upload it. Candidates are able to fill & submit the KVPY application form 2018 through online mode. The application form details are given below. Candidates can register for the KVPY exam from 11th July 2018. The last date for KVPY 2018 Registration will be 31st August 2018. Candidates have to fill their personal and academic details, choose test centre & upload photograph, signature & other certificates as applicable. Before filling the KVPY registration form, candidates must read the instruction carefully. Candidates can submit the application fee through online (Credit Card/Debit Card/Net Banking) mode. The application fee is Rs. 1000 for General category & Rs. 500 for SC/ST/PwD category). Qualifying Exam: Candidates who studied in Class 11th (science stream) must apply for this exam. Minimum Marks: Candidates have to pass class 10th with Mathematics & Science subjects & secure minimum 75% marks (65% marks for SC/ST/PwD) in aggregate. Qualifying Exam: Candidates, those studied in class 12th (science subjects) can apply. Minimum Marks: Candidates have to score minimum 60% marks (50% for SC/ST/PwD) in aggregate in Mathematics & Science subjects (PCB) in Class 12th. Candidates also have to obtain at least 75% marks (65% marks in case of SC/ST/PwD) in aggregate in class 10th. Qualifying Exam: Candidates who enrolled in 1st year of the UG programme in Basic Science (Physics/Chemistry/Mathematics & Biology) leading to B.Sc/BS/B.Math./B.Stat./MS/Int. M.Sc) can apply for this exam. Minimum Marks: Candidates have to score at least 60% marks (50% marks in case of SC/ST/PwD category) in 10+2 examination. The KVPY 2018 Admit Card has been issued by the exam conducting authority through online mode. Candidates can download their admit card from 13th October 2018. Candidates can get their KVPY Hall Ticket by using their “USER ID” & “Password”. The admit card contain the name of the candidate, roll number, exam center venue, exam date & time, category, etc. Exam Mode: The exam will be conducted through online (computer based test) mode. No. of Papers: The question paper will come in two sections: PART I & PART II. Marks: The question paper will be total 100 marks. Marking Scheme: In PART I, one mark will be given to the candidates for correct answer. In PART II, two marks will be awarded for each correct response. Negative Marking: In PART I, 0.25 marks will be deducted for incorrect answer. In PART II, 0.5 marks will be deducted for wrong response. The syllabus of KVPY 2018 is consist of the PCMB (Physics, Chemistry, Mathematics & Biology) Subjects. KVPY 2018 Syllabus is comprised of the topics & chapters of the Class 10th/11th/12th/1st year of B.Sc/BS/B.Stat/B.Math/MS/Int. M.Sc. There is no prescribed syllabus for this exam. It is very important to know the complete syllabus & exam pattern. Manage the time in such a way to give equal attention to each subject. Solve last year question paper, practice mock test & sample paper. Maintain your health & stay fit & healthy. Choose best books & study material. On the last movement, revision is the best. East: Patna (Bihar), Dhanbad, Jamshedpur, Ranchi (Jharkhand), Bhubaneshwar, Rourkela (Orissa), Naharlagun (Arunachal Pradesh), Guwahati, Tezpur (Assam), Shillong (Meghalaya), Agarthala (Tripura), Asansol, Burdwan, Durgapur, Kolkata, Siliguri (West Bengal). North: Chandigarh (Chandigarh), Delhi (Delhi-NCR), Ambala, Faridabad, Gurgaon, Karnal, Kurukshetra (Haryana), Jammu (Jammu & Kashmir), Jalandhar, Ludhiana, Mohali, Patiala (Punjab), Ajmer, Jaipur, Jodhpur, Sikar (Rajasthan), Agra, Allahabad, Ghaziabad, Greater Noida, Kanpur, Lucknow, Noida, Varanasi (Uttar Pradesh), Dehradun (Uttarakhand). South: Rajahmundry, Tirupathi, Vijayawada, Visakhapatnam (Andhra Pradesh), Belagavi, Bengaluru, Bidar, Chikkamangaluru, Davanagere, Dharwad, Haliyal, Hassan, Hubballi, Kalburagi, Mandya, Mangaluru, Mysuru, Shivamogga, Udupi (Karnataka), Hyderabad (Telangana), Alappuzha, Ernakulam, Idukki, Kannur, Kasaragod, Kollam, Kottayam, Kozhikode, Malappuram, Palakkad, Pathanamthitta, Thiruvananthapuram, Thrissur (Kerala), Puducherry (Puducherry), Chennai, Coimbatore, Kanchipuram, Madurai, Nagercoil, Salem (Tamil Nadu). West: Panaji (Goa), Ahamedabad, Anand, Rajkot, Vadodra (Gujarat), Amaravati, Aurangabad, Kolhapur, Mumbai, Nagpur, Nashik, Navi Mumbai, Pune, Thane (Maharashtra), Bilaspur, Raipur (Chhattisgarh), Bhopal, Indore (Madhya Pradesh). If you have any other doubts about KVPY 2018, you can ask your query in the comment box given below. I am now studying class 12 in 2017 and when I have to apply the application for KVPY and I have a pwd cirtificate can I apply? yes you can apply now. Sir,how l resister for KVPY re-examination .l have not found any links . please help me l wants to attend this exam . please say me sir. What can l do ? The candidates will be notified through email. More information will be updated in the website soon. Sir , I am doing my first year in bsc chemistry . I was wondering if I’m eligible for the kvpy 2018 . I have 57 percent in 12th.. I am interested in this exam..
Can I eligible for this exam… ..
Sir I passed 12th in 2016 .. I gives 2 years gap for preparing NEET exam and I study now also..
and I have 57 percent in 12th ..
Can I give kvpy exam..? Can I eligible for this exam..??? Whenever it will be released we will update in our article. When is the next form filling date in 2018 for 2019 exam?? I am 11th class I had missed kvpy exam so can I write this exam next year. I have passed my 12th in 2017.Am i eligible for the exam. Can I give kvpy exam again in 12th ,if I have given already in 11th..?? Sir,i passed 10+2 in 2016.am i able to give kvpy exam 2018 ? I passed 12th in 2017. Do i have a chance of sitting in kvpy exam in SX category? Currently iam preparing for Jee2018. You can appear in nxt year. I have not yet recieved my user Id & password please provide me the same as soon as possible. For that you should mail or contact with the officials. now i m studing in std.11 can i apply for SA in 2018 kvpy exam. got cgpa 9.8 in class 10.
sir i have not seen the date for apply the kvpy exam .I havn’t applied.can I apply now? The registration will start in July, 2018. I am a student of class 12 who took PCM Am i elligible for writing KVPY. I was complited kvpy 2016_17 my AR rank 786. I receive a letter from IISC. Through that letter l came to know that summar camp will be organise by IISC. But I have not getaing Informpation till date. May I know this date? I’m student of electronics can I attend this exam? Or it is compulsory to electronics student to take bio for this examination? I want to attempt KVPY IN 2018. I will be in class 12 then. which stream should i apply to? droper preparing for jee after +2 can apply? I have submitted application form on line and I have received the sms from you regarding taking print out of the application. But my question is how I can take this ? Sir, i have passed class 10th with 8cgpa marks in cbse board and this year i have jst passed class 12 with 58% from commerce stream. Can I apply this form? If yes then from which category? I have 8.4 cgpa in my 10th class.Am I eligible for this exam?? What’s the last date for online application??? i have passed H.S. in the year of 2017. Am i eligible to sit in the kvpy exam in the year of 2018,nov? hey! i got 7.4 cgpa in 10th class ..can i sit in kvpy 2017 exams? SIR IS THERE ANY MIN REQUIRMENT FOR OBC IN MARKS OR ELSE IT IS INCLUDED IN GENERAL. ,AND WHAT ABOUT FEES.ITS NOT MENTIONED CLEARLY. I am in class X (CBSE) now.When I can sit for KVPY (SA) ? I have passed with 70.2% marks under Wbchse board.but I admission in b sc bio programme. can I apply kvpy? plz,plz help me.. I have completed my class 12 in March 2017. presently I have taken a drop ( long term) to appear for the competitive exam in 2018. But I am interested to appear for KVPY 2017. Am I eligible to take the KVPY exam this year? If yes am I eligible for SX or SB stream. For sx stream you are eligible. Yes, you can apply. You can check the article for complete information. while filling the application, there is only General, SC/ST and OBC. But i am BC.. what should I mention while registering at KVPY..? I have just passed class 12 exam,can I will apply for this exam? 80% marks (70% marks for SC/ST/PwD) aggregate in the qualifying examination. Candidates also have to qualify the 10+2 examination with Science subjects & secure at least 60% marks (50% for SC/ST/PWD category. For Stream SB, Candidates have to complete their 10+2 examination & obtain minimum 60% marks (50% marks for SC/ST/PwD) in aggregate in Science Subjects. Candidates also have to pass their 1st year final examination & secure at least 60% marks (50% marks for SC/ST/PwD). and I have taken a drop since I want to prepare for JEE again. So am I eligible for KVPY and under which stream? (SX OR SB).Please help me out. I’m studying in class 12.. So according to it which stream I have to choose (sa or sx)? can i apply this application if i am in 9th or tell me do i need to wait till i reach 10th ???????????? you have to wait for 10th class. I am studying in b.phama 1st year . Am I eligible for appearing in kvpy? What is the Study certificate form??? your total percentage in 10th. Is is possible to write this exam being a NRI? I have 70% marks in PCM in class 10 & 73% in PCM in class 12. Am I elibible for admission in IISc/IIST/IISER/IITs if I qualify JEE Main & advanced & KVPY? i am studying 11th pcmc (computer science, i am eligible for this exam????? I am in OBC category .In 10th I scored 8.4 cgpa . Can I eligible for this test??? I studyingin 12th PCM can I apply?for 11thhowmany % required? I completed 11th grade in 2017.I am presently studying in 12th.Which stream should I apply? SA or SX? Can I write this exam just after passing 10th standard? Or should I wait till I pass 11th standard? You can write it after passing 10th standard. I did so last year. I am in 11th by taking single group. I want to give KVPY exam. Can I give it.